Encourage your little one to enjoy the outdoors with a sweet rocking chair that is just for them. It's a great place for them to sit and read their favorite picture book and a wonderful addition to any playroom. This child-size rocker will keep them comfortably seated with height 20-1/4 Inch. The sturdy wood construction, rounded edges and extended runners for extra stability. Easy assembly required. 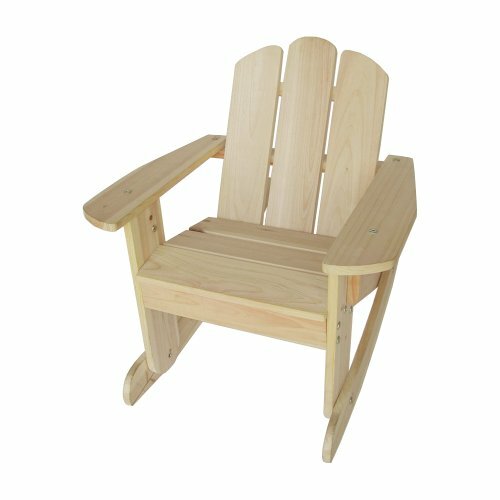 Ask your child to help you to assemble this Adirondack chair, making the assembly process full of fun. Recommended for ages 3 to 6. Seat dimensions 12-1/4"W x 10-1/2"D x 10-3/4"H, overall dimensions 25-5/8"W x 19-3/8"D x 20-1/4"H. weight capacity 80 lbs.